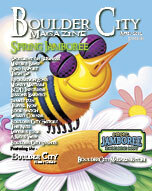 Boulder City Magazine is a monthly publication full of information about Boulder City and Southern Nevada. Boulder City Magazine features the Boulder City Home Guide, a real estate guide to Boulder City and Southern Nevada. Do you have an interesting collection you would like to show off? Perhaps you are a member of an artistic group and you would like to find other like-minded members of our community? At the Boulder City Library, we offer display cases in our lobby in which you may place your collections, artwork or other items. In the past we have had collections of: Valentines, inkwells, dolls, rubber duckies, pottery, wood crafts, nutcrackers, black-cats, masks, and more. The BCHS robotics team has promoted their club in the display cases. Our patrons enjoy looking at the collections. If you don’t feel you have enough to fill the cases, we can pull books from our collection to fill in the empty spaces. Another service we offer that benefits many groups in town is access to our meeting rooms. We have two meeting room spaces, the community room and the board room, which can be combined into one larger space. The library community rooms are available free of charge to community groups and organizations for meetings, workshops, seminars and programs. The rooms are not available for purely social purposes, nor for the benefit of private individuals or commercial concerns. The meetings must be open to the public and free of charge. The larger room also has a kitchen with a refrigerator, oven, microwave and sink. While we do not charge for the use of these spaces, donations to offset the cost of furniture, equipment and operations are greatly appreciated. The meeting room spaces are available during regular library hours. Groups which have insurance may also have access to the spaces after closing. The meeting rooms are a very popular service, and must be scheduled in advance. We will book meeting rooms up to six months ahead of the event. To schedule a meeting room, you must have an active library card in our system, and we have a form that needs to be filled out. Both our community room policy and application are available online at www.bclibrary.org. Our form is new, so if you filled one out a while ago, you will be asked to fill out a new form. If you would like to schedule a time to use our display case or to schedule a meeting room, please contact Deanna or Samantha at 293-1281. To find out more at the library, visit their website www.bclibrary.org or by phone at 293-1281. The library is located at 701 Adams Boulevard. The library is open 9-8:30 Monday to Thursday, 9-5 on Fridays, 11-4 Saturdays and 1-4 Sundays.